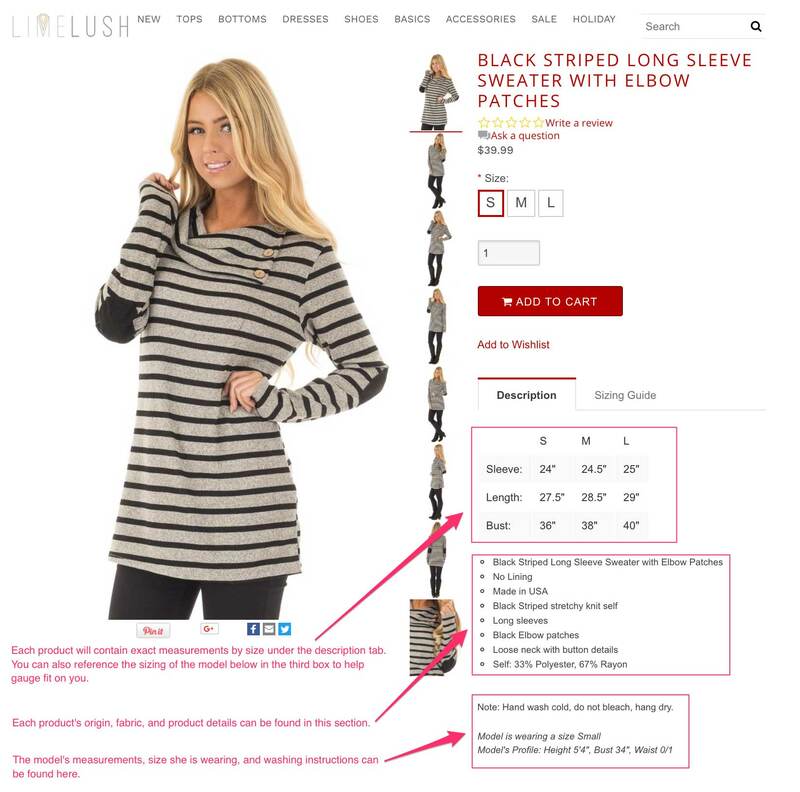 Exact measurements are found under the description of each product page. This is only a general guide and should not be used to answer sizing questions of individual products. If you were to take 200 medium-sized women of every different height, weight, torso length and width, leg length and thickness, arm length and thickness, chest size, etc and have them try on the same size medium, you will get several different answers of fit and each would look different in some regard as to where an item might fall at the hips, arms, legs, or how tight or lose it appears on certain parts of the body. The only way to precisely nail down fit is to take a measuring tape out and compare your own measurements against the exact product’s measurements of the item you are interested in. You can always order your usual size and return whatever doesn’t work as we are more than happy to take anything back you are not totally in love with; however, rather than risk having to spend the extra time waiting on a second package, a few extra minutes of measuring yourself one time will make your shopping experience much smoother. If you’re still feeling a little iffy about the size of a particular item and can’t find the information you’re looking for under the product’s description, we are more than happy to answer any questions you have about it. You can use the “Leave a Message” tab at the bottom right of our site, call us at 747.200.LIME (5463) or email us at help@limelush.com.